Wall Painting, Charlotte, NC | Pride Painting, Inc.
We’ll work quickly on your wall painting job to minimize disruption and improve the look of your space. You should never underestimate the power of a fresh coat of paint. 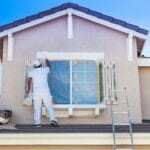 When a professional painter performs wall painting services in your home or business, this can bring a transformative power that refreshes the space and creates a new look and feel. Walls tend to be overlooked when it comes to cleaning, so they accumulate stains and buildup over the years. You may not notice when you’re used to seeing your walls all the time, but they often stand out to people who visit your home and business. At Pride Painting, Inc. we offer wall painting services to commercial and residential customers in the Charlotte, North Carolina area. We can repaint the walls of your business to change the atmosphere for your employees. For example, using shades of blue can help improve productivity while bolder colors like red and yellow might ignite feelings of passion and excitement. Neutral tones, which are most commonly used in offices, don’t necessarily offer those types of benefits but they do offer a clean space where employees can put up their personal decorations. When you want to upgrade your interior, contact us at Pride Painting, Inc. to learn more about our wall painting services. We take pride in offering competitive pricing, high-quality work, and efficient timelines. Instead of spending your day (or days) prepping and painting the walls, turn the task over to our team members. We’ll work quickly on your wall painting job to minimize disruption and improve the look of your space. You can relax and enjoy the new environment without having to lift a finger.